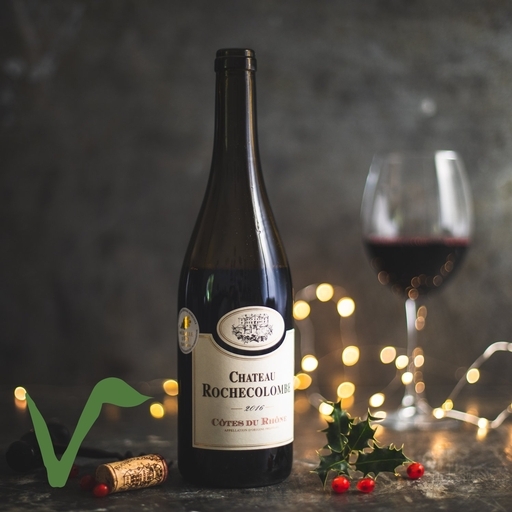 This is a full-bodied, smooth and balanced Côtes du Rhône, with enough tannins to make it interesting. Made with 50% Grenache and 40% Syrah, it has an impressive aroma of blackberry, damson and wild scrubland herbs. On the palate, bags of dark fruit with hints of liquorice and spice. A red to match more substantial dishes – particularly heartier meats or cheeses. Château Rochecolombe, located near Bourg Saint Andéol in the southern Rhône, has been owned and run by the same Belgian family for four generations. Today it is Roland Terrasse, the grandson, who has his hands on the reins. The focus is on quality throughout, both in the organically-certified vineyards and the cellar. The estate has been certified organic by Agence Bio (AB) for 10 years. Today there are 30 hectares of vines in production, planted on three different soil types, but all a variation on the classic Rhône clay/limestone theme. Facing south-east, the vines benefit from maximum sun exposure. Low-yielding old vines contribute greatly to the depth of flavour and intrinsic quality of Roland’s two red wine cuvées.